A living artwork dedicated to the health of our seas. The reef outside Bali Taman Sari Cottages along the bay in Pemuteran Bali is home to the award-winning Karang Lestari coral reef restoration project using Bio-Rock®, a method that takes advantage of a gentle electrical charge to enhance coral growth and survival rates. Pak Agung Prana who owns Bali Taman Sari Cottages, is also head of the NGO Karanh Lastari and the initial force behind the Pejalang Laut which protects this Balinese bay from destructive fishing. Ten years ago this coral reef was almost completely decimated and the success of this project now draws eco tourists from all over the world. On May 2nd 2011, an new Bio-Rock® underwater installation was introduced at Bali Tamin Sari. The Coral Goddess sculpture. Designed by artist Celia Gregory and her non-profit company The Marine Foundation. The Coral Goddess was added to this unique underwater project and is the first Karang Lastari Bio-Rock® structure to be powered by a green energy source. Two solar panels and a marine breeze wind turbine have been installed on a tower 30-meters in front of the resorts’ Bio-Rock Centre and attach to this newly sustainable underwater structure. The Coral Goddess was blessed during a traditional Balinese ceremony, with holy water collected from several local Balinese temples. The event included a combination of local components; villagers, hotel owners, dive operators, spirits and, a musician with a special song for the coral goddess by Fantuzzii. Ms. Rani Morrow-Wuigk who initiated the Bio-Rock re-generation project 10-years ago with the Pak Agung Prana family, has a dream that one day the project will be entirely powered by alternative energy. This first sustainable installation at Bali Tamin Sari Cottages of the Coral Goddess symbolizes an important turning point in the transition off-the-grid environmentally safe projects in Bali, Indonesia. The coral reef project and the Bio-Rock structures act as a nursery for fish and baby coral which can now re-populate the surrounding areas. It takes time for these corals to attach to a solid substrate such as the wrought iron used in a Bio-Rock sculpture. Each piece of coral is carefully selected. The transplanting process takes on the skills of both a surgeon and a gardener, with much attention and care to how the newly attached baby corals will grow and ensuring they have the best chance at survival. Additionally, the baby coral is available for sponsorship through the Bio Rock Center’s program. With every donation, sponsors receive their name welded to a live sculpture and baby corals transplanted for the occasion; this is an incentive program that includes photos and frequent sponsor updates. 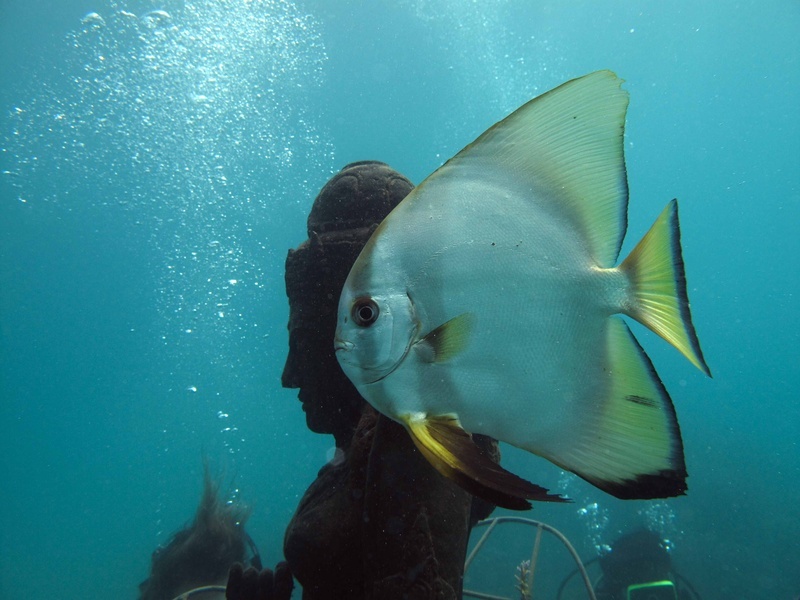 Visitors and tourists to the Bio-Rock Center at Bali Tamin Sari Cottages are welcome to visit this underwater gallery of over 50 impressive re-colonized and thriving under water art sculptures. Snorkel to the Coral Goddess directly from the Bio-Rock Centre, or tour the art garden from a glass-bottomed boat. Shallow dives with the Bali Dive Academy are also available. The Marine Foundation merges marine science and creativity to create strong, positive and visual images to raise awareness and innovative eco tourism attraction to generate an on-going income for the community.